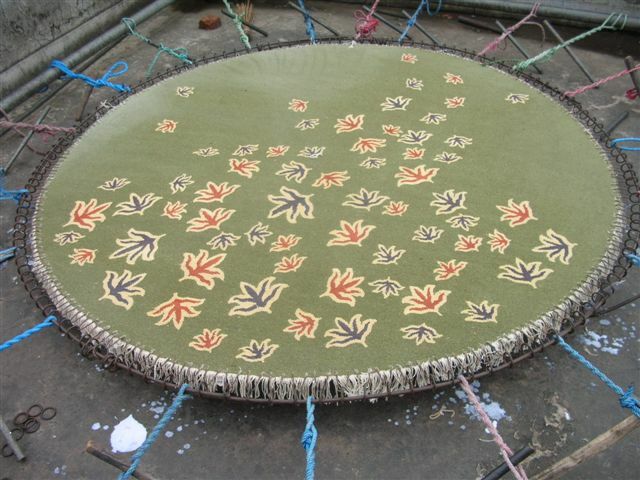 Carpet/Rug manufacturing has been the traditional business of the villages in the northern mountainous belt of Nepal . But commercial carpet manufacturing began in Nepal along with the exodus of Tibetan refugees in Nepal, in 1959. Though Nepalese were weaving carpets for generations, Europeans through Swiss association for technical Assistance ( SATA) contributed in the development of the carpet industry in Nepal through financial and technical support to the Tibetan refugees, In the beginning it was started as a source of living for the Tibetan refugees and the products were just the items for tourist consumption. Gradually, it began to attract a consumer adored initiated, in 1964. From the first commercial shipment to Europe, particularly Switzerland. Since then, it has transformed into a more value added, labor intensive commodity and remains the most important export product in Nepal by abysmal effort entrepreneurs with international vision. Click on above picture to see the rug making process on video. Wool sorting & washing:Tibetan wool is sorted to pick out foreign materials & other forms of wool to have stable product. It also needs normal washing to remove fat & wax from the wool.The wool is then dried in sunlight for two to three days. Wool obtained from the third countries is generally obtained after scouring process hence it doesn't need sorting & washing. Carding:After the wool get dry, carding is performed by hand using two hand brush to make the washed wool more soft to spun it by hand. 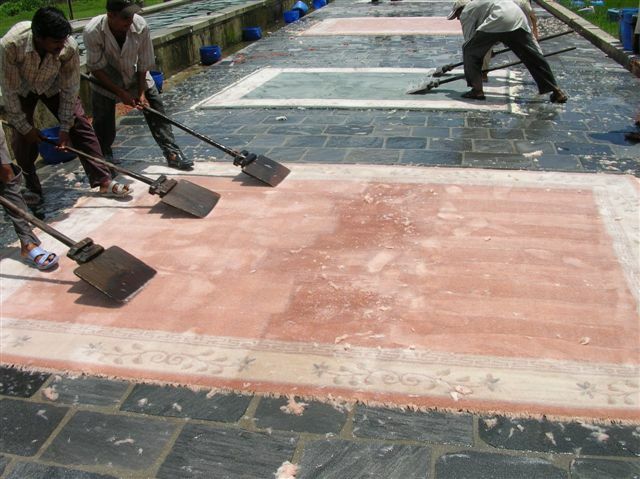 This process is very vital for to get natural texture on rug. But the hand carding couldn't fulfill the demand for expanding carpet industries. Hence machine carding is also performing for larger supply of carded wool for spinning. Spinning: Wool spinning is done by hand charkha. The experienced Nepalese spinners are capable of producing course as well as finer yarns for higher knots carpet. Dyeing: Dyeing was carried out in huge copper vessels, a manual estimation of color has been observe during this process which will result on natural texture of uneven colors on yarn. A vegetable dyes is also exists as per the requirement of clients. Beside this machine dye is also available for huge commercial order requirements. With the introduction of machine dyeing better fastness has been obtained. Also the use of synthetic dyestuffs has provided a large scale of spectrum color. The yarn is dried in the sunlight. 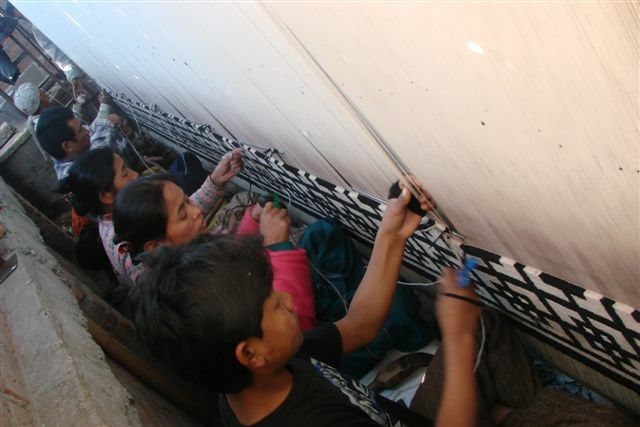 Weaving: Carpet weaving is performed by hand using graphs & sketches. 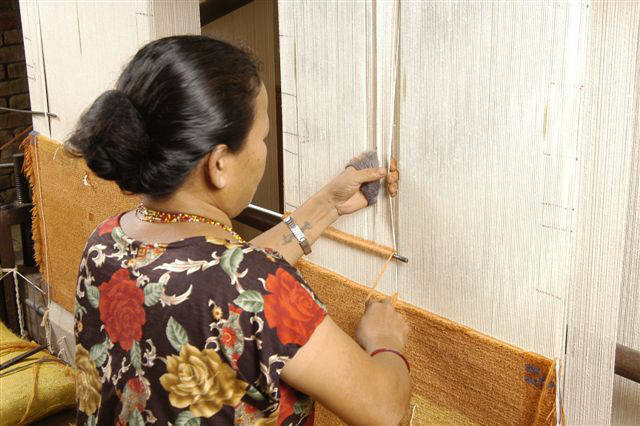 The carpet weaving is a creative task which is performed by three or more laborers according to the size of carpet. Carpet weaving is done with the help of yarn balls, scissors, iron-rod, levers, comb beater, etc. Century old traditional Tibetan double knotting system is applied for knotting on cotton wrap on typical hand loom. Cutting: First stage of trimming and cutiing on motifs and surface of the carpet has been carried out immediately after coming out off the loom, The sharp design & pattern is carved out by scissors from the woven carpet. The level of the pile is also made smooth according to the design. Washing and drying: Carpet is washed with fresh water using household chemicals to keep free of germs and wipe out the gloomy appearance. The wash is perform by experience labors by using a wooden plate called faruha, which should rub and hit around the carpet to open the tied yarn which make the front and top of the carpet more soft and smooth and it also bring the beautiful shine on finished carpet. The carpet is then kept flat on direct sun light for 4- 5 days to make it dry and to get the best shiny appearance, which we called natural dry, instead of putting it on hitting chamber. Final Trimming: Again the carpet is given a final trimming of the unusual yarn which comes after washing, in this case, any error in the design and pattern is trimmed and given the final touch. A three dimensional look will be given to motifs to look it more better. However the higher knots carpet kept untrimmed seeing the details and busy motifs. It still depend upon each individual client's requirement. Stretching: Carpet has to be stretched to bring into the original loom- stage size by stretching. Stretching provides the good appearance of carpet if it is under sized or twisted/wrinkle anywhere. Only a simple glue called Fevicol is to be use with the mixture of water to fill up the gap of stretch and to get permanent result on carpet. Stretch carpet then look very nice and perfect on the floor. Final Packing: Finally the carpet is packed with the environment friendly packing material. After that the carpet is ready for export. Most of the Custom Order Carpet pack and ship folded, not rolled. Only the bulk order package will be rolled for shipment.